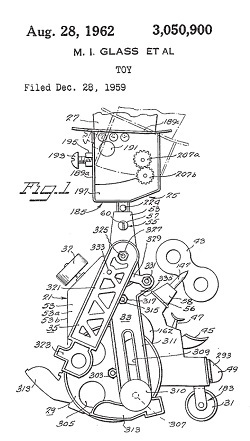 Determining Patent Eligibility – Part 3, What Constitutes a Machine? 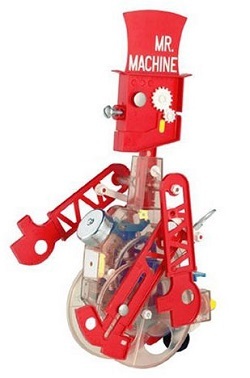 One of my favorite toys as a kid was Mr. Machine. He was a windup mechanical man that swung his arms when he walked while repeatedly squawking a strange YAK! sound. His body was transparent, so all the gears and levers inside were visible, and he even came with his own repair wrench. Alas, his wrench was of little use when Mr. Machine took a tragic fall down the basement stairs. Mr. Machine was aptly named. There’s no question but that he was a machine, because his inventor received a US patent, No. 3,050,900. In order to accomplish this he had to have met guidelines set out in federal statutes, specifically those contained in 35 USC § 101. He had to prove that Mr. Machine was a bona fide machine. If you’ll recall from last week’s discussion, in order to secure a patent, inventions must prove to be original technology that is classifiable as a machine, an article of manufacture, a composition of matter, or a process, or an improvement upon same. Last week our focus was on utility, the first hurdle that an invention must jump for it to be patent eligible. Let’s continue our discussion on patentability by examining the second hurtle. When you consider the word machine, you might imagine something containing mechanical parts, like my childhood mechanical friend. But in the world of patents that’s not necessarily the case. There, a machine can be mechanical, electrical, electronic, or electromechanical in nature. In other words, a machine can include anything from a cell phone to a rocket. To be precise, under patent law the definition of machine includes any physical device consisting of two or more parts which dynamically interact with each other. For example, a purely mechanical machine, such as a diesel engine, has many moving parts. Those parts, the pistons, connecting rods, etc., are mechanically linked to dynamically interact, or move together, when the engine runs. Next week we’ll consider less obvious examples of what constitutes a machine under patent law. Posted in Engineering and Science, Expert Witness, Innovation and Intellectual Property, Product Liability, Professional Malpractice | Comments Off on Determining Patent Eligibility – Part 3, What Constitutes a Machine? When I was growing up in the 1960s the Chicago Tribune featured a comic strip by Bill Holman called Smokey Stover. 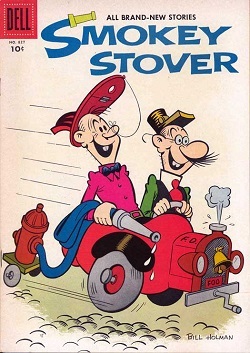 Smokey was a fireman who had all sorts of ridiculous, nutty, and even bazaar inventions, like his two-wheeled fire truck called the “Foomobile.” In the real world his inventions could never work, but that didn’t stop me from being a kid and enjoying Smokey’s goofy adventures. Smokey’s fire truck would never pass a patent test. Why? Because it wouldn’t get past the first requirement for patentability, that is, utility. Last time we introduced the federal laws governing patents as found in Title 35, Section 101, of the United States Code (USC), 35 USC § 101 for short. It sets out requirements for patentability, and the first hurdle that an invention must jump is that it must possess the quality of utility. In other words, it must be useful. This quality of utility prevents ridiculous and/or hypothetical devices, such as Smokey’s Foomobile, from receiving a patent. Because the Foomobile consists of an engine and two wheels mounted on a single axle, there’s nothing to keep it from falling over. The weight of its engine makes it front-heavy and unstable. The nutty vehicle will tip forward, and its front bumper will become wedged in the ground. The Foomobile is just not capable of passing the test of utility because it cannot be operated as intended – Smokey would never make it to the scene of the fire – and it’s unable to provide any identifiable benefit to its users. Once the hurdle of proving an invention’s utility is passed, the next considerations for patent eligibility must be addressed. Is the invention a machine? A process? Just what defines a machine? Is it something with gears and a motor? Next time we’ll see how within the context of patent eligibility, the word machine can apply to things which are not at all mechanical.